In August 2013, Mark Post of Maastricht University served two lab-made beef patties at a much-publicised event in London. Post created the pieces of meat for an astounding US $325,000 each. It was later revealed that the secret funder of the project was Google co-founder, Sergey Brin. Brin is just one among a host of investors that include governments and venture capitalists from the Silicon Valley, who are putting money into research and development to produce lab-cultured meat and processed meat substitutes. Lab-made meat has largely been part of science fiction. Today, scientists are closer to making this a reality. At least 30 groups of researchers from universities and private companies are currently working aggressively to create substitutes for large-scale manufactured meat. The last decade has seen a surge in academic and general interest in the field of cultured meat. The reason for this, apparently, is the rising concerns over human consumption of meat and unsustainable current practices of livestock farming in terms of its environmental cost. 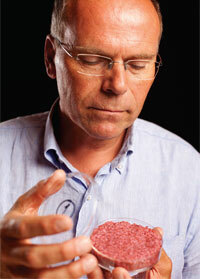 The petri-dish beef created by Post’s team in 2013 opened the floodgates for more experiments of synthetic or in-vitro meat production as a viable alternative. The idea to create animal-free alternatives to meat is not a new one. For over two decades vegetable proteins have been processed to create food products that imitate meat while being healthier and far more sustainable. Meat substitutes created from soy, wheat-gluten and vegetable proteins have steadily increased their market share in Western countries in recent years. Though their market share has increased, “fake meat” is still seen as an inferior substitute, which while tasting good, misses out on meaty textures and associated tastes. That perception looks set to change. A steady stream of funding from several high-profile investors has enabled better research and more investment into efficient technologies. Every year or so, new “fake meat” products claiming improvements over previous attempts have hit the markets. The concept behind plant-based meat substitutes is to extract and repackage plant proteins in food processing units to mimic meat. The plant proteins are treated with edible dyes, binding agents and taste enhancers so that the finished product looks, feels and tastes more like their non-vegetarian counterparts. The entire process involves heating, cooling and pressurising the proteins so that they align themselves to imitate animal protein. Perfecting the pressure technique was a challenge in creating meat imitations, but the introduction of the extruder is a potential game-changer. The extruder, a mechanical food processor, is used to create sausages from meat aggregates. Now, US-based Beyond Meat has used the extruder to process pea and soy protein into products with meat-like consistencies. The imitations created by Beyond Meat have been perfected to such an extent that a sample of their “fake” chicken fooled New York Times food writer Mark Bittman into believing he was eating real chicken! Cultured meat refers to the production of animal muscle tissue in a controlled environment and in isolation from the animal itself (see box: ‘Fleshing out’). This effectively eliminates the aspect of animal cruelty and inhumane treatment that has been associated with traditional meat production. A 2011 study published in the journal Environment, Science and Technology claims cultured meat requires 7-45 per cent lesser energy inputs, 99 per cent lower land inputs and 82-96 per cent lower water inputs, while also reducing greenhouse gas emissions associated with meat production by 78-96 per cent. Moreover, increased livestock farming has led to a rise in health risks emanating from viral and bacterial strains causing epidemic outbreaks in recent years. Though hurdles within the lab are being overcome, their financial viability poses a far greater challenge. The cost of the beef patties created by Post was astronomical, far out of the reach of the middle class. “Just like with any other new product entering the market, prices will reduce with scale,” explains Datar. “As a high-end product it (cultured meat) may take five to six years. As a large-scale commercial product, it will take more than seven years,” claims Post. Kurt Schmidinger, head scientist at Future Food, an Austrian organisation conducting research on meat alternatives, is more grounded. “At present, the production is far from being commercially competitive with meat from animals, and it is not clear if a complicated technology like cultured meat can ever deliver products as cheap as industrial animal farming practices,” he says. Even as the technology takes shape, the ethical question is inevitable. Though in terms of sustainability and animal cruelty concerns, the answer seems pretty straightforward, but how much interference with nature is too much interference? The “are we playing god?” question is also bound to crop up. We have, for a long time, depended on science to solve our problems. The question is whether science holds the key to consumption-driven imbalances?